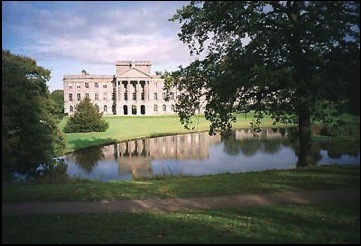 A walk around the National Trust grounds at Lyme Park. 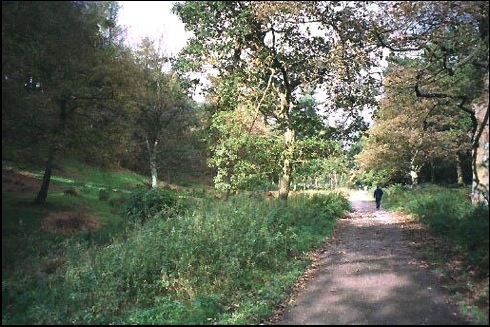 Peter - one of the "Boys" - and my Uncle Harry had mentioned to me how beautiful Lyme Park is, This is located between near Disley on the Manchester to Buxton Road. Anne and I therefore took the opportunity to visit it when we stayed near Manchester for the weekend to see my eldest son Greg and his wife Jen. However, our interest was not in the house and gardens but to have a walk on the high moorlands which shelter this National Trust property. Click on map to enlarge. However, please note because of scale limitations not all of the places mentioned are to be found on this map. 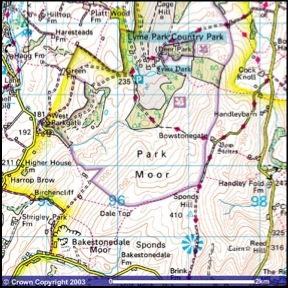 Many years previously I had purchased a book on Peak District walks and one of the walks was a "five miler" starting from Lyme Park. This was to be the basisfor this ramble. However, because of the age of the book some detail had changed and it was necessary to refer to my Ordnance Survey Map (Explorer 268) for Wilmslow, Macclesfield and Congelton, which includes the Lyme Park Estate.Having paid our car parking fee (£3.50) – Mick would not have liked that - we drove into the estate and after about a mile we reached the imposing property and drove into the car park to its right. Although the weather forecast was for rain, the sun was trying to break through the clouds as we put on our boots and waterproofs before obtaining a very helpful map of the estate from the National Trust Information Centre. Then we were off. Leaving the car park we skirted the house, and its enclosed garden, anti-clockwise. It looked beautiful and we were so taken with it that we completely missed the turn to the south that went through an avenue of lime trees. However, within 20 or 30 yards I realised we were on the wrong path and backtracked to the lime tree avenue, which we followed up hill. Suddenly Anne said, "look" and just to our left, having a late breakfast, were a pair of deer. I did try to get a photograph of them but they had heard us and vanished before I could get a suitable "shot". 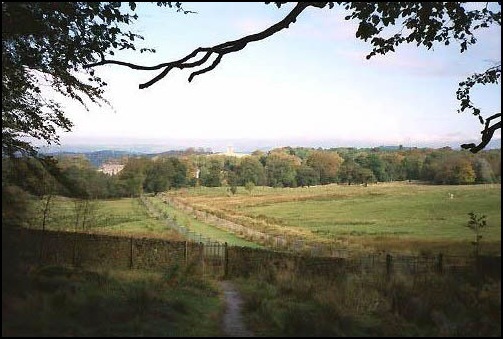 Looking back towards Lyme Park House from just inside Knightslow Wood. We continued up hill with Anne realising that her lack of walks in recent weeks was having a detrimental impact on her ability to ascend the hillside. However, one of the pluses of this particular walk was that most of the hill climbing was at the start so the hard bits would soon be over. Open moorland. 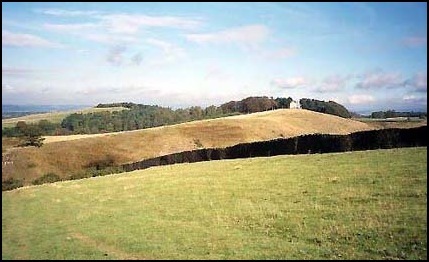 The white building to the right is the farm at Bowstonegate. We left the lime trees and had wonderful views back to the house with the Manchester conurbation beyond and to our right and left more deer could be seen. 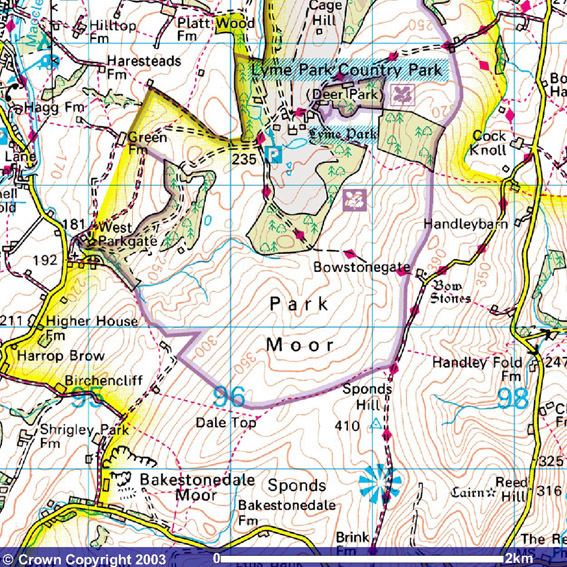 We then entered Knightslow Wood before reaching open moorland and further walking up hill brought us to Bowstonegate and its namesake farm at just over 1000ft above sea level. The next phase of the walk was much easier. A wide track on top of the moorland ridge took us south and after about a third of a mile we turned right (west) and followed a less well defined track that hugged the wall on our right. Looking over the wall we had wonderful views back towards Bowstonegate Farm and to its left across the moor back to Lyme Park. The early part of the track was a bit muddy but did not cause us any difficulties and by the time we reached Dale Top, about two thirds of a mile further on, the track was much better. At this point I should have veered left, away from the wall, by about 30 degrees but instead we merrily sauntered down the hill to a farm at the bottom where I expected to be greeted by a "right of way" sign. But the only sign we saw said "Private" and I then realised my error. Open moorland near Dale Top with Manchester in the distance. The "right of way" had been moved since the walk book had been published. But it was no great concern; we just turned left down the track called Moorside Lane that took us away from the farm towards a village called Pott Shrigley. Isn’t Pott Shrigley a wonderful name? Makes me think of potted shrimps. I wonder how it got this name! However, it’s not the only strangely named place around here. 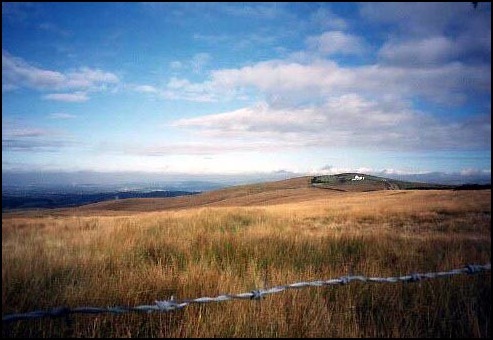 A couple of miles south is Ginclough, which is near a place called Rainow and further south, near the Cat and Fiddle Pass, is a place called Bottom-of-the-Oven. I suppose if you look at any map in detail you will find strange named places, but there does seem a large number in this area. After walking a 100 or so yards down Moorside Lane we reached the right of way we wanted. So it was turn right and over a stile and through a field on a very good path. However, there was one problem. The field was full of cows and Anne is a bit like Larry and does not like passing through inhabited cow pastures. But the cows weren’t interested in us and carried on grazing as we walked swiftly past them. Walking through Hase Bank Wood. On reaching the Shrigley Road we turned right and immediately right again, down a very narrow lane, and in a 100 yards or so turned right, yet again, and through West Parkgate, which, as the name indicates, is the west entrance back into Lyme Park. Once back in the grounds we were confronted by beautiful mixed woodland – Hase Bank Wood. A wide path took us uphill through the trees for about half a mile until we reached open parkland and from here we followed an obvious estate road back to the house and our car. Although the walk was only 5 miles in length it was very interesting and with such diverse scenery I would certainly enjoy doing a variation of it again. And what about the forecast rain? It came five minutes after we had left Lyme Park and it was torrential.